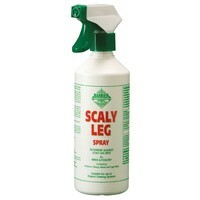 Barrier Scaly Leg Spray 500ml is a highly effective deterrent but can also be used to treat an existing problem. Scaly leg mite can affect birds of all ages and can cause pain and intense irritation, this scaly leg spray can be used on chickens, turkeys, game and cage birds to tackle the issue. Easy and straight forward to use, simply spray the product onto the legs, comb and wattle every few weeks for general maintenance. To rectify an existing problem, isolate the affected bird and spray the legs, comb and wattle every 5-6 days to break the egg cycle. As well as insect repellent this high quality spray also soothes and calms irritation. Barrier Scaly Leg Spray is suitable for use in organic farming systems because the only active ingredients included in this product are plant oils. Fully HSE approved and does not taint eggs.